Here I am, with a tiny post made to take part to another lovely Bloggers Do It better challenge :). This time the theme was "arm party", so that means bracelets, bracelets and...more bracelets ! Here here there are a few close ups of my arms. I am just so in love with wrap bracelets lately and I have bought quite a few of them ! Plus, I always wear my Tiffany bracelets and also my gold Fope bracelets !. I couldn't go out without my bracelets and rings, instead I never wear earrings. My ears aren't even pierced ! What about you instead ?. Eccomi quì con un piccolo post dedicato al nuovo carinissimo "compito" di Bloggers Do It better :) Questa volta il tema era "arm party", ovvero bracciali, bracciali e ancora...bracciali ! Ecco un paio di foto in primo piano dei miei polsi, si capirà che ultimamente sono andata in fissa con i braccialetti cosìddetti "wrap", che si avvolgono al braccio e che sembrano più bracciali in uno ! Inoltre, indosso sempre i miei braccialetti di Tiffany e quelli nei tre colori dell'oro di Fope !. Non potrei mai uscire senza braccialetti e anelli, invece non indosso mai orecchini, non ho neanche i buchi alle orecchie ! Che mi dite di voi invece ?. Alla fine li puoi mettere sempre e con qualsiasi cosa, al lavoro come in discoteca. beautiful bracelets :) i'm a huge fan of it. Hey I participated in the BDIB challenge too! I came across your link and I'm loving your arm party! Beautiful bracelets! The floral dress seems beautiful too. Adoro quel ciondolino a forma di shopping bag Tiffany! Carino questo post! nuovo post sul mio blog: ti aspetto!! So adorable this. This challenge seems like much fun! ciao cara.. i tuoi post sono sempre cosi' interessanti! è sempre un piacere leggerti!! un bacione! I'm a big fan of cuffs, which have a similar effect to layered up bangles, and dangling earrings! Beautiful jewelry you piled up here, and I love the effect of the charm bracelet against the stacked up bangles! Your blog is so sweet ! Very nice pics, thanks for your visit on mine too!! Let's follow each other !! I love your arm candy! I also love the Bulgari Bzero ring. Mine is 9 years old already amd I still wear it often! Thanks to all for your comments ! I will visit ALL your blogs very soon ! Hello Vale it's a pleasure to meet you and thank you for commenting on my blog - keep on piling on the bracelets! really pretty bracelets girl! loving the stack up. ero rimasta indietrissimo con la lettura del blog, ma ho recuperato eheh ;) eri favolosa con il vestito bianco!! bellissima!! Mi piacciono molto i braccialetti wrap, ma anche gli orecchini! A casa ne ho tantissimi e quasi ogni giorno ne indosso un paio diverso! Unfortunately I missed out on the arm party? It looks so fun too! p.s I have been doing an arm party at work for the past two weeks!!! Hi darling! I love your beautiful bracelets! To answer your question, I was born on the East Coast in the USA but my brother was born here in Cali. :) Wishing you a fantastic weekend in beautiful Italy! ma che bel blog! complimenti! ti seguo!! Next time you are in the US I hope you'll come west to LA! Looks like NYC was a blast, love that city! I'm inspired by the wrap bracelets! Your arm party really caught my eye. This BDIB challenge was so fun, right? ciao cara!! io sono iscritta!! non riesci ancora a vedermi? ho la foto di audrey hepburn! grazie per il consiglio sul blackberry! appena decido, vi farò sapere! Like your blog and the many different ways you can look. from barcelona i'm loving your bracelets!!!! 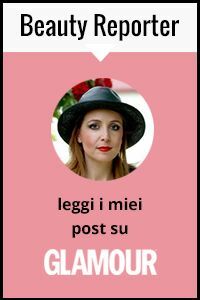 Per qualsiasi aggiornamento basta diventare follower del mio blog o seguire la mia pagina Facebook! 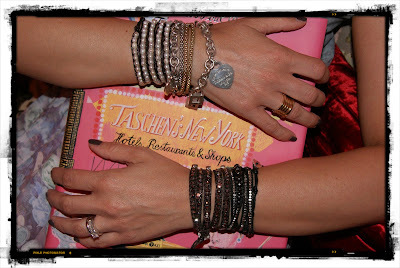 thanks for your comment ;-) loving your arm parties here! following your blog!!!!! if you like can you follow mine as well? Congrats! Love the pictures and post! I also got married recently (25th June) and you just inspired me to post some pics on my blog as well. "My ears aren't even pierced ! What about you instead ?." My ears are pierced and I love earrings and necklaces yet, I'm not into bangles. I guess we're opposite, eh. Though I love you collection of bangles, classy and chic!